Give your students practise writing with detail and using vivid words. This exercise will help your student add descriptive details to improve writing. This adjective exercise will prepare kids for writing and reading nonfiction stories about real-life heroes. Hone your haunting writing skills this Halloween with a ghostly grammar sheet! This will help your child practise adding adjectives to sentences. The sentences on this year four reading and writing worksheet are pretty boring. Kids liven up the sentences by adding descriptive adjectives to the nouns. The sentences on this year four writing worksheet are pretty boring. 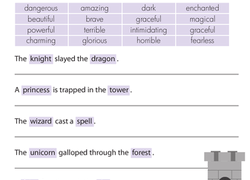 Kids liven up the sentences by adding descriptive adjectives to the fairy tale nouns. Make your writing really POP by adding a splash of colour with some great adjectives. Jumpstart creativity in writing workshop with this brainstorming organizer for sensory words. Adjectives That Start With "I"